1. 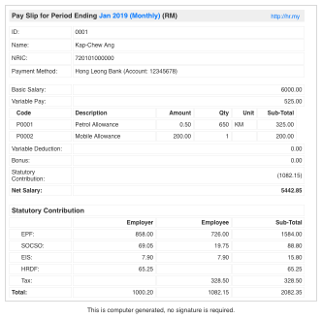 If you need more flexible and better payroll calculation, such as generating EA Form automatically or adding allowance that does not contribute to PCB, EPF or SOCSO, you may want to check out HR.my - Free Malaysian Payroll and HR Software, which is absolutely FREE! Forever for UNLIMITED employees. BTW, Payroll.my PCB calculator 2019 is powered by HR.my's payroll calculator. FREE Document Workflow to allow online submission of expense claims, purchase requests, OT requests, stationery requests etc. All leave and document workflows support up to 3 levels of approver, such as Line Manager, Head of Department or Branch, or any custom approvers like Boss, Director etc. FREE! FREE Online Document Sharing, Discussion Forum and many more that you will have to see it for yourself. Most importantly, new features are being added every month for FREE! As it stands now in Jan 2019, tens of thousands of Malaysian employers (with hundreds of thousands of employees) have already discovered the best ways to improve employee productivity and collaboration on HR.my without spending a single cent! 2. Employee Salary plus any other allowances. If you wish to ONLY calculate the PCB for bonus of an employee with monthly salary, you will still need to enter the monthly salary of the employee even if the bonus is paid at a different date. This will calculate the combined tax for both salary and bonus in the payslip, after that you may deduct the tax of the monthly salary component to get the bonus-only tax. E.g. if monthly salary is RM 5,000, with a yearly bonus of RM 5,000, then for an employee who is not married, the combined tax for both salary and bonus is RM 650. For the same employee, monthly PCB for salary alone will be RM 130, so the tax for bonus is RM 650 - RM 130 = RM 520. Alternatively, you may change the Calculate For option to Bonus Only, this will show the exact amount of statutory contributions for the bonus component only. For employees who receive wages/salary of RM5,000 and below, the portion of employee's contribution is 11% of their monthly salary while the employer contributes 13%. For employees who receive wages/salary exceeding RM5,000 the employee's contribution of 11% remains, while the employer's contribution is 12%. The minimum Employers’ share of EPF statutory contribution rate for employees above age 60 who are liable to contribute will be reduced to four (4) per cent per month, while the Employees’ share of contribution rate will be zero per cent. If you need to check total tax payable for 2019, just enter your estimated 2019 yearly income into the Bonus field (leave Salary field empty), and enter whatever allowable deductions for current year to calculate the total amount of tax for current year.